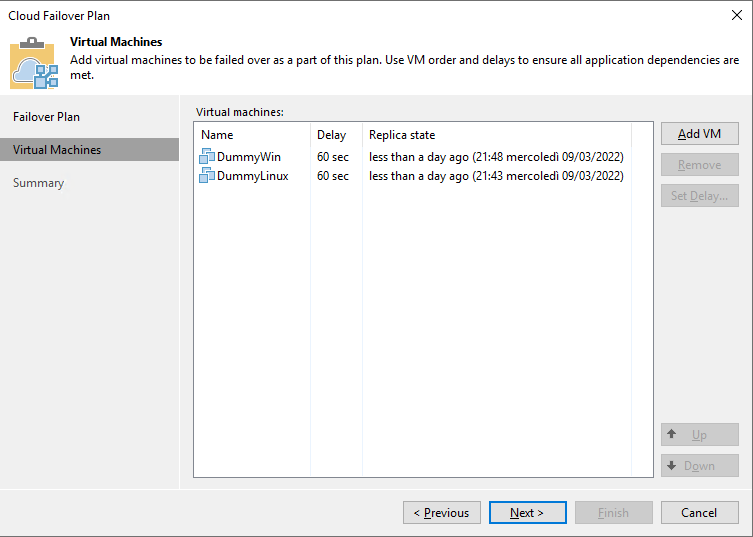 As described in chapter 6.3, Failover plans are also available for virtual machines replicated towards vCloud Director. The main difference between vSphere and vCloud Director failover plans is the complete delegation of network management to VMware NSX in the case of vCloud Director. Once the protected virtual machines have at least one restore point stored into Veeam Cloud Connect, a tenant can use the failover capabilities he subscribed to. In order to complete a failover, a tenant can choose to failover one single virtual machine, or to orhcestrate the entire process by configuring a Failover Plan. A Failover Plan is a group of virtual machines that Veeam Backup & Replication has to manage as a single entity, following the boot order and delays configured in the plan itself. When it comes to Veeam Cloud Connect, a Cloud Failover Plan has additional options. After giving the new Failover Plan a unique name (unique for the tenant, as multiple tenants at the service provider can have the same name for their failover plans without any problem), the tenant selects the virtual machine he wants to add to this plan. As a last option, virtual machines can also be started directly from the vCloud Director web interface.